This article is about the 2010 film. 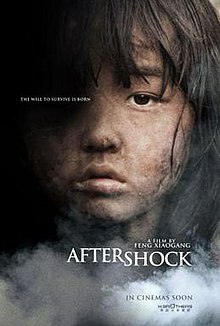 For the 2012 film of the same name, see Aftershock (2012 film). For the 1990 film of the same name, see Aftershock (1990 film). Aftershock is a 2010 Chinese disaster-drama film directed by Feng Xiaogang and produced by Huayi Brothers, starring Zhang Zifeng, Xu Fan, Zhang Jingchu, Chen Daoming, Lu Yi, Zhang Guoqiang and Li Chen. The film depicts the aftermath of the 1976 Tangshan earthquake. It was released in China on 22 July 2010, and is the first "big commercial film" IMAX film created outside the United States. The film was a major box office success, and has grossed more than US$100 million at the Chinese box office. Li Yuanni and her husband, Fang Daqiang, and their twin children, Fang Deng and Fang Da, live in a small apartment in Tangshan. One night in 1976, after putting their children to bed, the couple make love in the back of their truck. An earthquake suddenly breaks out, causing buildings to crumble and disintegrate. While rushing back to save their children, Li is pulled back by her husband, who runs ahead of her and is instantly crushed by falling debris. Their apartment block collapses and traps their children under a pile of rubble. In the aftermath of the earthquake, a rescue team informs Li that her twins are trapped under a large slab of concrete. Lifting up the slab in any way will cause one of her children to die, so she can only choose one to save. Feeling heartbroken, Li decides to save her son, Fang Da. The girl, Fang Deng, survives and regains consciousness later to find herself among several dead bodies. Assumed to be an orphan, Fang Deng is adopted by a military couple, Wang Deqing and Dong Guilan, who bring her back to their home in Beijing. She is renamed to "Wang Deng" after taking on her adoptive father's surname. Ten years later, she moves away from home to study in a medical school in Hangzhou, where she meets a graduate student, Yang Zhi, and begins an intimate relationship with him. In her third year, Fang Deng's adoptive mother becomes critically ill. Before dying, she asks Fang Deng to use the money they saved to find her real family. Fang Deng finds out that she is pregnant later. Despite being pressured by Yang Zhi to undergo an abortion, she refuses to abandon her child and secretly drops out of university and loses contact with Yang and her adoptive father. In the meantime, Fang Da's grandmother and aunt had wanted him to live with them in Jinan, Shandong Province but eventually decided to let him remain behind in Tangshan with his mother. The earthquake had claimed his left arm, rendering him physically disabled. After deciding to not take the National Higher Education Entrance Examination despite his mother's insistence, Fang Da starts working as a cycle rickshaw driver and eventually becomes the boss of a successful travel agency in Hangzhou. He marries and has a son, Diandian, with his wife. After a period of four years, Fang Deng brings along her daughter, also named Diandian, and reunites with her adoptive father. She apologises and reconciles with him. On Lunar New Year's Eve, she tells her adoptive father that she is getting married to a foreigner and will be emigrating to Vancouver with her daughter. In 2008, Fang Deng sees the earthquake in Sichuan on television. She immediately volunteers to join rescuers and returns to China. Fang Da has also decided to help in the rescue efforts. While taking a break, Fang Deng overhears Fang Da talking about the Tangshan earthquake. She reunites herself with her brother, and they both decide to visit their mother. At first, Fang Deng is angry at her mother for abandoning her. Later, after realising the remorse, emotional agony and guilt that her mother had gone through, she forgives her mother. The screen then cuts to a stone memorial in Tangshan with the names of all the 240,000 victims of the earthquake. The film was produced by Huayi Brothers, which partnered with IMAX to produce three Chinese films (of which Aftershock is the first). In Singapore, it is distributed by Homerun Asia with Scorpio East and Golden Village Pictures. Aftershock was released in over 5,000 conventional and 14 IMAX theaters in late July 2010. In early August 2010, the film surpassed The Founding of a Republic as the highest-grossing locally-made film in China, with a RMB532 million gross. The film was selected as the Chinese entry for the Best Foreign Language Film at the 83rd Academy Awards, but failed to make it into the final shortlist. Aftershock won the Best Feature Film and Best Performance by Actor for Chen Daoming at the fourth annual Asia Pacific Screen Awards. Raymond Zhou of China Daily placed the film on his list of the best ten Chinese films of 2010. The film currently holds a 90% rating on Rotten Tomatoes with an average score of 6.4/10, although there are not enough Western reviewers. The film won "Best Director" and "Best Actress" (for Xu Fan) at the 5th Huading Awards. ^ a b c Schuker, Lauren A. E. (15 June 2009). "Imax Set to Partner With Chinese Studio". The Wall Street Journal. ^ Stephen Cremin (18 May 2013). "So Young enters China's all-time top ten". Film Business Asia. Archived from the original on 19 March 2015. Retrieved 31 May 2013. ^ Landreth, Jonathan (14 March 2011). "Japanese Distributor Delays 'Aftershock' Release After Sendai Quake". The Hollywood Reporter. ^ Coonan, Clifford (29 June 2010). "'Aftershock' to shake up Chinese box office". Variety. ^ Beaton, Jessica (10 August 2010). "'Aftershock' breaks box office record". CNN Go. CNN (Time Warner). Archived from the original on 13 September 2010. Retrieved 6 September 2010. ^ Coonan, Clifford (27 September 2010). "China sends 'Aftershock' to Oscars". Variety. Retrieved 29 September 2010. ^ "Winner Asia Pacific Screen Awards Best Feature Film". Asia Pacific Screen Awards. Archived from the original on 8 December 2010. Retrieved 2011-01-08. ^ "Winner Asia Pacific Screen Awards Best Performance By An Actor". Asia Pacific Screen Awards. Archived from the original on 8 December 2010. Retrieved 2011-01-08. ^ Zhou, Raymond (30 December 2010). "Top 10 movies of 2010 in China". China Daily. Archived from the original on 22 January 2011. Retrieved 30 December 2010. ^ "Rotten Tomatoes - Aftershock". Rotten Tomatoes. Retrieved 5 March 2013.